This colour woodcut is a proof for an illustration to Le Bestiaire ou Cortège d'Orphée by Guillaume Apollinaire, published by Editions d’Auteuil, printed by Robert Blanchet in an edition of 230 copies. Painter and printmaker Bernard Lorjou (1908-1986) produced 33 woodcut illustrations to Bestiaire in 1951. Apollinaire (1880-1918) was a highly original poet whose visual imagery with surrealist juxtapositions inspired many artists to illustrate his work, the most popular being Alcools, first published with a frontispiece by Pablo Picasso (1881-1973) in 1913. A number of artists illustrated his Bestiaire. It is a collection of short poems, each representing the qualities of a particular animal. When first published, in 1911, it was illustrated with woodcuts by Raoul Dufy (1877-1953). Poet and scholar Walter Strachan (1903-1994) was fascinated by the art of the book. His interest was inspired by a visit to an exhibition of artists’ books at the National Gallery in London in May 1945. In due course he wrote many articles on the subject, as well as a major reference work, The Artist and the Book in France (published 1969); he also encouraged successive Keepers of the National Art Library at the V&A “to buy them for England.” To this end he visited France every year, to meet the artists, and acquired proof pages to illustrate his articles and to show to potential purchasers of the books, including the V&A. Over the years he amassed a collection of images of owls; some of these were illustrations from livres d’artistes, and others were designed especially for him as gifts or greetings. 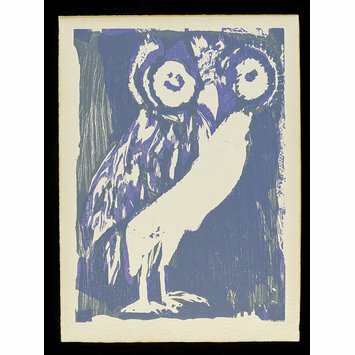 The collection of owls began with a visit to the artist Roger Chastel (1897-1981) in 1952, where he witnessed the printing of Le Bestiaire de Paul Eluard. In a subsequent article (“Genesis and Growth of a Collection”, for Connoisseur, 1972) he explained: “My article on Chastel’s Bestiaire had the happy result of bringing me a special print on Auvergne paper of the owl which I had admired in the book. Contacts in the art-world of Paris are close and friendly, and I was marked down as an owl-man, in consequence of which I have gradually been given dedicated owl prints and originals in every medium from pen and ink to enamel…” Strachan owned a copy of the book for which this is a proof illustration. This double page proof is an illustration for the artist's book Le Bestiaire ou Cortège d'Orphée by Guillaume Apollinaire, published by Editions d'Auteuil, Paris, 1965. 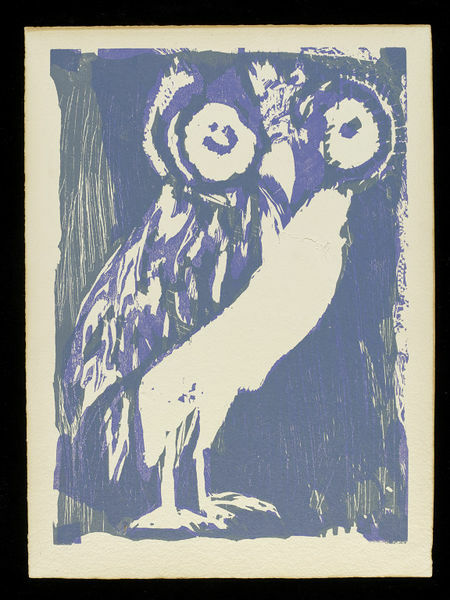 It shows a colour woodcut of an owl against a purple and green background which has been scratched to reveal white line. The owl is largely purple and appears transparent so that some of the background green shows through. It's breast is left white. This is an alternative trial illustration to E.245-1994. This forms part of a collection of prints, drawings and paintings of owls bequeathed to the V&A by Walter Strachan (1903-1994). Strachan, a scholar and collector of Livres d'Artistes, became friendly with a large number of artists, who, on hearing that he had a fondness for owls, began sending him images to add to his collection. Colour wood-engraving, trial illustration for an artist's book, Le Hibou, by Bernard Lorjou, 1965. Apollinaire, Guillaume. Le Bestiaire ou Cortège d'Orphée. Paris : Editions d'Auteuil, 1965. Strachan, Walter J. Graphic owls from France: variations on a theme in an English private collection. Connoisseur. Aug. 1972. pp.240-247.